"The absolute best sauce to serve with grilled salmon, steamed artichokes, and boiled new potatoes in the summertime. Lumpfish caviar can be found in gourmet food stores or cheaper at IKEA. Wonderful with salmon, it's also great with other more mild fish dishes." I live here in Sweden and can buy the commercial variety of this.. but this recipie is fantastic,, even better than the store-bought one! I served this with salmon puffs as well as melba toasts. I love the saltiness. It's similar to Taramosalata. Stunning. Very difficult to fault this receipe. Add fresh chopped Chives and a dash of Paprika powder for color. Note this receipe makes a lot of sauce! 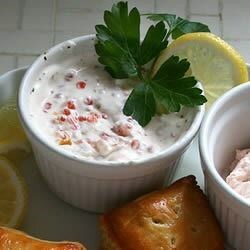 Great salmon/caviar recipe! Very colorful and bright. I almost took one star away for being a little too salty, but decided against it.